Keep going on man, I'm reading it! GREAT DYNASTY. "I'm feelin it!" San Antonio will have a first look at the Lakers, the team that eliminated them in the Western Semifinal playoff. But there will be no Shaq, who give trouble to Spurs frontline. There will be no Payton, who after struggle in first 2 game of the series, manage to recover and make life harder to Parker, And there will be no Fisher, the player shot the game winner with 0.4 sec of deciding game 5 of the series. They lost Turkolou in free agency but get a combo guard in Brent Barry. Barry will come from the bench to replace both guard positions and a very good shooter than Hedo. “They were a team on a roll, they win 2 straight games and their confidence is high. Our team came from a lost but we’ll try to bounce back,” said Coach Popovich. Tim Duncan came from a 33 point and 12 rebounds performance against Sacramento but got a little support from his teammates especially from Parker who only chipped in 6 points in 1 of 7 shooting. Lakers on the other hand, get a solid offensive game with 4 players averaging in double digits. Bryant leads the team with his 22.5 PPG while Odom had 19 PPG and had team-best in assist with 7 a game. “This maybe the biggest test for us” said Coach Rudy T.
Both Parker and Stoudamire have a very sub-par start in this season. Parker struggle on his 1st game against the Kings and score only 6 in 1 of 7 shooting. Stoudamire maybe averaging 10 point but has only 3 assists in 2 games. A breakout game from either of the two will be a great news for his team. Let's see who get the better of this two. this one seems a realistic one. i like the way your preview and recap. just like im reading it in nba.com. just make it longer as they said but anything else was good. As you asked for it heres a longer more detailed game recap. Hope you like it!!! After scoring only 6 points from 1-7 shooting, Parker scored perfect 5 of 5 for 12 points in the first quarter. As a result the Spurs jumped to a 12-4 in the early part of this quarter. Lakers struggle not on shooting but for turnover as they committed 5 turnovers. Woes continue as the team saw they starting center Divac injured with 3.54 left in the first period. But Lakers got a big break as Manu Ginobili got his 2nd foul to forced Coach Popovich to put him on the bench. Barry took his place and even score a long jumper from the sideline to make it 20-13 count. But Barry, more known for his shooting and passing, can’t guard Bryant. Bowen switched to him but only saw Butler, who substituted for Odom scored 5 straight points. As the quarter comes to an end, Lakers had made a 10-0 run and over took the lead at 23-20. Bryant drive thru traffic to keep their lead in 2nd quarter. Bryant started the 2nd quarter from the bench. The Spurs took advantage and made a run to took over the lead. This made Coach Rudy put back Bryant. But it was Mihm who helped the Lakers grabbed back the lead. Then both team traded baskets most of the way. The 1st half ended with Lakers lead by 5 points. At halftime break Lakers athletic trainer Garry Vitti said that Divac will not play the 2nd half and will be evaluated. But Vitti was optimistic that it was not a serious injury and may play next game. 3rd quarter showed all about Spurs. They came from 5 points deficit to a 5 points lead at the end of the quarter. Kobe Bryant gone cold and held scoreless the entire quarter. While Odom was held to only 4 points shooting just 4 shot and made just 1. Bowen scored 13 points in this quarter while Duncan and Rasho control the rebounds. Odom started the 4th quarter by slamming a two-handed dunk from an Atkins steal. But it was really his off-night as we managed to score just 2 more points to finish the game with 6. Spurs knowing Odom was struggling, concentrate more on Bryant as they double team him. As a result Bryant had a hard time scoring as he score only 4 in that crucial stretch. Spurs took an 11 point lead 72-61 but a late surge by Lakers put them behind by only 4, 78-74 with 31 sec left. They made it a free throw battle and put Bowen to the line. The gamble paid of as Bowen missed both charity but a very crucial lapses coz the Lakers the game. Nesterovic get the offensive board and Lakers fouled Bowen again. This time he split the charity. Trailing by 5, Stoudamire dribbled the ball past mid court passed to Kobe and shoot a desperation 3. But his shot was blocked by Bryant and the game ended at the score of 81-74. Lakers saw their 2 game winning streaks come to an end. Last edited by Micchy_boy on Fri Sep 03, 2004 5:53 pm, edited 1 time in total. Hmmm, I think you should up the minutes per quarter you play. You seem to be getting low scores and it may help you and CPU get more rebounds. Just a suggestion. match_66 wrote: Yeah the recaps are a little short, talk about the important moments. I notice in your box scores that, ur rebounding is a little low, not too bad, but do you run the game at a slow pace or something?? thanks match_66. well about my rebouding, was it low, i always get rebounds like that. i hardly get a player get a 10 or more rebounds (even shaq in my dynasty before). my sliders in the first page but i think it something to do with my shoting and CPU percentage so i dont get too many rebounds. any help or advice you can give to make my rebounding go up high??? Umm, i sorta used to have the same problem, but i get heaps now, i always crash the boards hard out, like rebounds mean more than points, ill give you my sliders next time i get a look at them. Anyway keep it up, this dynasty is real good, although use butler more, hes a good player. yo Great job, this awsome. After a disappointing lost to rival Spurs, the Lakers start the game by scoring 10 points while allowing the Hawks with only two points. But Hawks don’t want to extend their losing streak to 3 so Walker and Gerald Wallace put on a run to overtake the lead at 21-18. Grant, Odom and Butler. 3 ex-Heat players, helped to regain the lead. Grant rebounded the ball then an outlet pass to Odom for a easy 2. On the next play, Butler steals the ball and goes for a slam. Another basket by Grant from an Odom offensive rebound gives Lakers a 23-21 edge as the quarter comes to and end. But a buzzer-beater by Tony Delk from mid-court made it a 24-23 count as they headed to 2nd quarter. Kobe goes for a reverse dunk in 2nd Quarter. Lakers made a mistake on their last game but not starting Bryant in the 2nd quarter. So Coach Rudy T started Bryant and easily scored a basket. He followed it by 2 free throws from a Childress foul to make it a 3 point lead. Grant got his 3rd personal foul after just 1 ½ minute in this quarter. Lakers offensive game was on high gear in this quarter but they defense was a sub-par. The biggest lead they made was only 6 points. With 1:10 left in the 2nd quarter, Tony Delk was injured. The Hawk survived the last minute and was trailing only by 6. Delk checked back in the start of the 3rd quarter. But it was Walker who caught fire in this quarter, scoring 11 points. Malone and Grant were to slow to guard the Hawks forward. So Coach Rudy T made some adjustment and put Odom in power forward position with Butler taking his SF spot. This gamble paid off but in the end Lakers was lead was trimmed from 6 points to 4. Childress lost a battle against Bryant but his team won. After Walker, his other teammate also caught fire. Delk, Harrington and rookie Childress helped the Hawks to tie and even take the lead. The Lakers was still in the ballgame with less that 2 minute left trailing only by 3. They even take the lead back but Childress made a lay-up and Delk added 2 free throws. Odom scored a basket and Bryant fouled Childress. The rookie calmly sank the 2 free throws with 5 sec left. After a timeout, Bryant attempted a 3 point but was shot only hit the rim as time expires. i updated my sliders i will post it soon. plus im playing now with 9 min per quarter. If you noticed that i don't have a hawks-lakers recap, well i decided to save it on my next dynasty on NBA LIVE 2005. and i like to finished this dynasty before the release of next live. But score more with KOBE! How do you expect him to win MVP with those kind of numbers? thanks for the advice of playing more minutes. well honestly in my older dynasty (which i dont post) kobe ave 33 plus points, 8 assists and 5 steals hehehe. dont worry Kobe usually up his game during all-star. maybe in the future you will see kobe scoring 40 points 13 consecutive game and tie wilt for the record hehehe. i try to up his scoring but honestly i like to see odom, butler score. that my 3 best players i guess. Man, you an sbhzmafia really wanted me to start a dynasty. Both of you present it so well and take good pictures and re-cap everything in detail. I like that you make good trades and don't screw over every other team by taking their franchise player. So keep it up Micchy, I really want to see more soon . Bryant open his scoring with an open shot to a 30-point production. Lakers jumped to an early 13-2 count. The Hornets didn’t expect to see Lakers high pressure defense, full court press and a fast-pace and running game. Baron Davis tries to bring his team back but to no avail. But same old story happen again. Every time Lakers’ bench came in the game to give the starter a rest, their offense became sour and their defense collapse. Bryant was called for his 2nd foul to add problem to the Lakers. It was too late to realize that their lead was almost gone. The end of the quarter Lakers saw their biggest lead of 13 was now down to 3. Davis try to bring his team back but he can do it by himself. In 2nd quarter, Lakers lead was completely erased and was now facing a 3 point lead 29-26. Coach Rudy T realizing how bad his bench players were playing forced to check back in Bryant and his other starter. Lakers made a run and they play like the team that led early in the game. Lakers build an 11 point lead but this time, he let the starter finished the quarter. The only question running to Coach Rudy T was, can his starter have enough energy to play most of the game. Coach Rudy T surprisingly started Atkins, Mihm and seldom-used Walton along with Bryant and Odom. He tried if this combination will work. But after playing with this 5, the Lakers lead was again chopped down to 5. This forced him again to play his starter almost the last 6 minutes of the quarter except Bryant, who commit his 4 personal fouls. Butler did a great job filling Bryant position and was always the one who finished most of Lakers fastbreaks. Playing like well-oiled machine as they up their lead to 16. Before the quarter ends Coach Rudy T re-enters Walton, Atkins and Mihm this time along with Bryant and Grant. They held on to lead as they enter the final quarter with 14 point cushion. Magloire try to help Davis but it was to late. Odom always answer Hornets run in 4th quarter. As Lakers enter the final canto, all they need was to protect their lead. They didn’t let Hornets to make a run. They deliberately slow the game, melt the clock and especially to let his starters rest inside the court. Odom take over the game in this quarter scoring 10 to protect their lead. On the other hand, Davis was the only want to give a fight. His teammate was struggling or just gave up already. In the end both team scored 21 points and Lakers 14 point lead remains. Much better.. Keep it up, and Kobe will definitely be MVP! Also, who's Caron Butler patch is this? EL SEGUNDO, Calif., Nov 10 -- The Los Angeles Lakers announced Wednesday they have activated guards Sasha Vujacic and Kyle Korver and placed forward Vin Baker and guard Chucky Atkins on the injured list. Rookie Vujacic and Korver will be in uniform tonight when the Lakers travel to Memphis. Game time is 7 p.m.
Lakers cant find answer to Gasol scoring. Laker found no answer to Grizzlies duo of Mike Miller and Pau Gasol in the quarter. Gasol score 8 points down low while Miller sniping outside for a 7 point output. Everything’s going well for the Memphis. They have an 12-4 lead and the Lakers seems lost. But when J-Wil was called for his second foul, the Lakers take advantage of it. They try to harass and trap Watson which resulted for some turnovers. 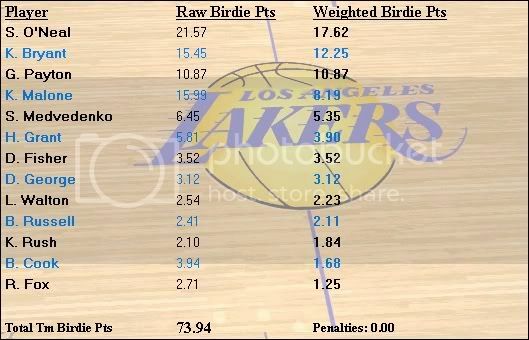 This helped the Lakers to crawl back in to the game. Lakers balance scoring kept the game close. All starter score for the Lakers but got nothing from their bench. The game was like a shooting contest where both team shooting very high from the field. Lakers shooting 56% while the Grizzlies 68% shooting from the field. Quarter ends with Grizzlies holding a precarious 1 point lead. Stoudamire dish a no loook pass to Odom for an easy dunk. Malone try to beat the buzzer. Gasol continue to lead his team in scoring and got some help from Wells and Swift. There were instance that they build an 8 point lead but the Lakers will comeback to make it a very close game. Still only the starters carry the scoring load for the Lakers with only Butler scoring with 2 points. Malone, Odom and Bryant each score 10 points to pace the Lakers. Lakers bench wake up in the 3rd quarter as they score 12 of teams 21 points. And after facing a 9 point deficit, Lakers bench make a run and had a 3 point lead at the end of the quarter. But what really turned the ballgame around was the good defense of Mihm and Grant to Gasol and was held scoreless in that quarter. But Posey and Swift take the scoring for the Grizzlies. After shooting 50% (Lakers) and 61% (Grizzlies), Lakers shot 43 % and Memphis 46%. An Alley-oops to Posey in one of Grizzlies fastbreak. Miller helped Gasol and Posey to give Lakers their 3 lost. Lakers collapsed in the final period scoring just 14 points while allowing the Grizzlies with big 34 points. Lakers players can’t catch up to Grizzlies running game. Williams push the ball while either Posey or Miller finishing the break. Lakers completely lost their confidence and struggle as they still miss open shot and easy layups. Grizzlies were hot from the field and finished the game shooting 58% on the filed compared to Lakers 45%. Last edited by Micchy_boy on Mon Sep 06, 2004 3:20 pm, edited 2 times in total. EL SEGUNDO, Calif., Nov 10 -- The Toronto Raptors announced Wednesday they have activated guards Sasha Vujacic and Kyle Korver and placed forward Vin Baker and guard Chucky Atkins on the injured list with bone chips in his right elbow. This game feature two evenly match team which carry an identical 3-3 record. Francis started the ballgame by hitting a 3 pointer. It was followed by a rare 4-point play by Dwight Howard to make it a 7-0 score. After that it was a trading basket affair. A mini-run by Lakers will be answered by a mini-run by the Magic. Magic game plan was center to their backcourt duo, Francis and Mobley. On the other hand, the Lakers try to give the ball to the post and take advantage of the match-up of Malone or Grant against Dwight Howard. Howard have done a marvelous job defending the veteran and tally 3 big block shots. With 3 minutes left in the quarter, Malone collided with Howard and injured his back. Bryant led the team with 10 while Francis carried the scoring load of Magic. Magic preserved their early 7 point lead. As the second was about to begin, Gary Vitti said that Malone will be unable to continue to play and need to evaluate Malone condition. Grant will have to fill Malone spot and he did effectively scoring 6 points. Odom also play few minute at power forward position. Malone’s injury seems like a blessing in disguise as the trio of Odom at PF, Butler in SF and Bryant in SG rally the team to tie the ballgame at halftime. Divac injury became a blessing in disguise as the Lakers break away from the Magic. WHAT A CRAZY 3RD QUARTER IT WAS!!! Lakers jumped to a five point lead in this quarter. They protected it and even up their lead to 9. Then suddenly Divac got injured 7:41 left in the quarter. Lakers starting frontline were both injured and things seems going the wrong way. Coach Rudy field in Grant, Odom, Butler, Bryant and Stoudamire and suddenly something strange happen. Lakers made 7 or 8 consecutive shots while Magic score a basket or two in that span of time. With a close game gone into a blowout, Lakers fielded his bench players to give his starter some rest. Mihm, Walton, Butler, Korver and Vujacic (almost all white guys) and they just continue what the starter done. They even made a 16-0 run. Lakers finished the quarter leading 88-55, outscoring the Magic 47-14 in this quarter. Mobley beat the shot clock. Vujacic joined the scoring barrage for a career-high 14 points. With a 33 point lead, the final canto was just a formality. Both teams bench players played mostly this period. But even it was just garbage period, Lakers still outscored the Magic and the final score was 115-74 for a 41 point winning margin. Thanks Micchy Boy for providing those real end of season stats! It was a great help as now other people can see how they fare against a real life, Dynasty. Looking forward to your 2004-05 midseason pstat file! how do u get pics of the scoring screen and crap. Brezec will be in uniform tomorrow night when the Lakers travel to Houston. Game time is 7 p.m.
With Divac on the injury list and Malone questionable for the game, Lakers start the ball game with Mihm, Odom and Butler forfrontline and Bryant and Stoudamire at backcourt. This game features to of the best shooting guard in the league. McGraydy started the ballgame with a 3 but Bryant answer it with a big dunk. Yao Ming stole the spotlight as he scored 6 points in the quarter, dominating the duo of Mihm and Brezec. Rockets were leading 25-18 when Lakers make a 8-0 run courtesy of Odom and Vujacic. T-Mac goes for a break away dunk for a 30 point production. Mihm tallied 6 blocks, mostly against T-Mac. Lakers offense picked up in the 2nd quarter. Odom and Butler took turns in scoring basket while Mihm and Stoudamire great defensive job helped the Lakers to build a 19 point lead. The scary part of this was Bryant scored only for 6 in 3 of 10 shooting. McGrady paced the Rockets with 15 point but lacks support from his teammate. Rockets were now facing a 16 point deficit. Bryant-T-Mac match was highly-anticipated by the fans. The scary thing happened in 3rd period. Bryant scored 9 points and helped to up their lead to a big 31 points. Mcgrady scoring only a point didn’t help the Rockets. They shot 37 % but allowed the Lakers 77% in that quarter. Rockets need a major miracle to turn this bal game around. Lakers cruise along in 4th quarter. Rockets surrender the game and didn't even try to make a run. Bench players play mostly the final period with Vujacic finishing with 12 points. Every 2 weeks in my game schedule, i will post the current standing of all the teams. And every end of month, i will post standing, league leaders and even MVP candidate. Guys right now i'm considering to not post my dynasty anymore .... due to the fact that i dont see good responses from you guys. im will still play and finish this dynasty and im also trying to prepare materials for my Dynasty on NBA Live 2005 to make my next dynasty good enough for all of you.